Who Really Decides How Language Works? To hear some sticklers talk, you’d think that somewhere, in a classified location, there’s a top-secret grammar law library that houses the voluminous Grammar Penal Code: an official list of all the things you’d be “wrong” to do. It’s wrong to split an infinitive, some say. It’s wrong to end a sentence with a preposition. It’s wrong to begin a sentence with and. It’s wrong to use take to mean bring. Hang around these people long enough, and you see the list of no-nos is endless. Their source, conveniently, is never revealed. They know what’s wrong and they’re not telling you how they know—as if they have a copy of the Grammar Penal Code and you don’t, so you’re forever at their mercy. With every word you speak or write, you’re in danger of getting busted for breaking a rule you never knew existed. Here’s where these nitpickers get their information: someone—a teacher, a parent, a know-it-all friend—told them there’s a rule against saying a certain thing, and they believed it. It’s as if they, too, were fooled into believing there exists some list of grammar crimes that only their teacher, parent, or friend was privy to. It’s a grammar snob Ponzi scheme. There is no official source of grammar prohibitions. For the English language, no one has the authority to lay down laws. Rules exist. It is possible to speak or write ungrammatically. It’s possible to be “wrong.” But right and wrong derive from a far more powerful, albeit hard-to-pin-down source: us. Look at the sentence Him wants to eat dinner. That’s ungrammatical. The pronoun is in the object form instead of the subject form he. But the rule that says to use a subject pronoun here was not decided by some governing body. It wasn’t an idea someone came up with and then demanded English speakers comply. Instead, this grammar rule is derived from how people actually use the language. Grammar, therefore, is at its heart a set of standards based on common practice. If suddenly everyone in the English-speaking world started saying him wants instead of he wants, sometime in the next century him would be correct, sanctioned by every grammar authority alive. We’ve just waded into some very treacherous waters. Language experts distinguish between “standard” English and “nonstandard” or “substandard” or “colloquial” English. One might argue that he goes is standard English and he go is substandard, even though millions upon millions use both regularly. There’s no separating this debate from issues of class, race, geography, and socioeconomic status. The minute someone says x is standard and y is not, they’re making a judgment call about whose English reigns supreme. Just as the winners write the history books, the most powerful group of English language users write the grammar books. Every student of grammar needs to understand that underlying all discussions of grammar propriety is a struggle over who gets to call the shots—whose English is the official English. The criterion for correctness is pretty simple. If someone accuses you of misusing between in a sentence like We passed the guacamole between the three of us, the most widely sanctioned referee for these skirmishes is a good dictionary. Even better, consult two or three, because they don’t always agree. A dictionary maker, or lexicographer, documents how words are used. When enough of us use a word a certain way, it becomes an official form worthy of being documented in the dictionary. Put another way, we vote on what’s right every time we speak or write, and lexicographers tally our votes. Dictionaries aren’t official bosses of the language, either, exactly. But their rulings become a sort of de facto authority. Dictionaries are the best tallies of how we, the real language bosses, vote to use words. Between, for example, has a number of definitions, but one in particular cuts to the heart of a common controversy: the idea that you can’t use between for relationships involving more than two people. In fact, you can. Between, dictionaries say, can be used in instances like The pie was divided between eight people. 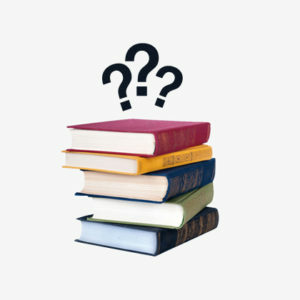 Publishers follow guidebooks called style guides. These reference works are extremely handy for making sure every page of your publication is consistent on matters like when to spell out numbers, whether to put periods in O.K. or even to use okay, whether to abbreviate Street and Avenue, and whether to write the possessive of James as James’ or James’s. These guides also talk a lot about grammar and usage. For example, the two most widely influential stylebooks in American publishing, the Chicago Manual of Style and the Associated Press Stylebook, agree that that and not which is used to introduce what are called restrictive clauses (for more, see the chapter 5 discussion of relative pronouns starting on page 64). The car which crashed into the telephone pole was red. The car that crashed into the telephone pole was red. These are style guidelines, not grammar rules. If you’re editing a publication that adheres to either style, it would be an error to use which in that sentence. But doing so is no more a grammar error than using numerals instead of words to write 100. A great deal of modern-day grammar confusion stems from people not understanding the role of style guides. Their rules are not meant as definitive statements on what’s right or wrong. They simply work as playbooks to be followed by anyone who wants to follow them. But the rest of us are not bound by them—a fact some people fail to understand. Over a century ago, teachers were telling students they can’t use over to mean more than. A prohibition against splitting infinitives by inserting an adverb after the particle to was also making the rounds. The belief that it’s wrong to end a sentence with a preposition was already widespread. And children got bad marks for starting sentences with and and even but and so. These “rules” have shown impressive staying power. From cocktail parties to kitchen tables, these seemingly fascinating bits of grammar trivia have been repeated over and over, in some cases for centuries. Too bad they’re not true. These are just a few of the many grammar myths that have been handed down from generation to generation, often making their way into classrooms. Most trace back to some overzealous language prescriptivist stating opinion as fact, often in the pages of misguided textbooks. Here’s a good guideline: If someone tells you that it’s wrong to X, where X is something native English speakers do regularly, you can be pretty sure the rule is bogus. If it pertains to word usage, check a dictionary. The answer’s in there. If it pertains to syntactical structure, check your own newfound knowledge of syntax, along with your knowledge that there’s no such thing as the Grammar Penal Code. If it’s something people use regularly both in casual conversation and in published writing, it’s probably idiomatic. Dictionary definition, syntax, and idiom are the only rules that apply. If your usage meets any one of those criteria, it’s fine. 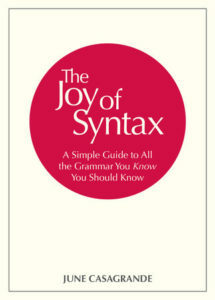 From The Joy of Syntax: A Simple Guide to All the Grammar You Know You Should Know. Used with permission of Ten Speed Press. Copyright © 2018 by June Casagrande. June Casagrande is the author of Grammar Snobs Are Great Big Meanies and Mortal Syntax. She is a former Los Angeles Times staff reporter, and her “A Word, Please” grammar column currently appears in several community news sections. She has also studied improvisational comedy with renowned troupes the Groundlings and ComedySportz. Her latest book, The Joy of Syntax is forthcoming from Ten Speed Press.